Every case of CF is different, so not every herb that I list here is going to be helpful for everyone with CF. What herbs to take depends on what symptoms you have and your energetic constitution. If possible, contact a local herbalist (especially those that are American Herbalist Guild registered) or naturopath to discuss what herbs may be right for you. Here is a short list of herbs that may be helpful for some people with CF in certain situations. By the way, the doses I mention here are for the "average" adult, so children should take smaller doses in proportion to their weight. Doses are always tailored to each individual's needs. Remember to always inform your doctor of what herbs you're taking and to discuss your use of herbal supplements with a qualified expert in herbal medicine, especially if you are taking prescribed pharmaceuticals. If you have any additional questions about these herbs or others, please contact me. I go to school for this stuff, and I love talking about it! Turmeric (Curcuma longa) is a root used in Indian cooking and Ayruvedic medicine. It is a potent anti-inflammatory, and it has another magical property: it can partially correct the faulty CFTR channel in CF! Curcumin, a compound contained in turmeric, facilitates better functioning of the sodium/chloride ion gradient across the cell membrane (problems with this ion gradient are at the root of the pathology of CF). Curcumin can cause a change to the shape of the CFTR in deltaF508 and the G551D mutations in cell models . However, in human models (that is, us) turmeric alone does not provide significant clinically observed benefit, besides mildly reducing overall inflammation in the body. But when combined with genistein, a constituent of soy, the combination can be a more potent corrector/potentiator of the CFTR, facilitating observable (and often significant) clinical benefit. 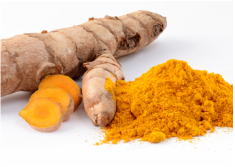 For more information on the curcumin + genistein combo, read this article. Curcumin also helps reduce allergic airway inflammation, which is characteristic of asthma . Multiple human trials have shown its safety at very high doses, up to 8,000 mg per day , but for we will need less than that for our uses in CF. Intestinal absorption is very low unless accompanied by black pepper and a fatty meal. So buy curcumin capsules that include black pepper in their formulation, and eat them with a fatty meal or snack. I've written a bit about garlic here already, but I want to reiterate how powerful this plant is in so many ways, especially for respiratory infections. Garlic has strong antiviral, antifungal, and antibacterial properties when crushed and eaten raw . This is largely due to the antimicrobial powers of the constituent allicin in garlic. Its constituents enter the blood stream via the gut and volatilize when they circulate through the lungs, causing "garlic breath". Thus, our goal when using garlic medicinally is to eat enough to induce "garlic breath" because that means that means its antimicrobial constituents are having direct effects within the lungs themselves. During colds, flus, or acute lung infections, one can eat up to a bulb of garlic a day. Dose depends on how well your stomach can tolerate the pungency, and how much you're willing to piss off your loved ones with the smell! Just make them eat garlic too and they won't notice the smell as much. You can mix raw garlic in raw honey to make it more palatable, or drink it in a fire cider preparation. In order to potentiate the allicin you must crush the cloves and let them sit for 5-10 minutes before eating, chopping, or cooking with them. When I'm feeling sick with a cold, I usually chop up 2 cloves of garlic at a time and swallow the pieces with water like pills. I do this 3-5 times a day until symptoms resolve. Baikal skullcap (Scutellaria baicalensis) is an herb now commonly used in Western herbalism but comes from the Materia Medica of Chinese Medicine. Its root contains bitter and cooling iridoids, such as catapol, and flavonoids such as baicalin, scultellarin, and wogonin . Its flavonoids are epigenetic regulators and reduce inflammation by shutting off prostaglandin formation and nuclear factor kappa-B . Baikal skullcap shares a significant amount of chemistry with Scutellaria lateriflora or American skullcap, which we use commonly in Western herbalism as a nervine and anxiolytic. Baikal skullcap, on the other hand, is mainly used as a strong anti-inflammatory. It is used in inflammatory diseases such as cardiovascular disease, liver disease, autoimmunity of all types, and cancer. It is also helpful for those of us with runaway inflammation due to chronic infection. I have used it successfully in combination with andrographis to cool my chronic fevers associated with my lung infections. This is a very cold plant, so for people who tend to run cold it may not be the best option. I use 2mL of tincture 2xday of this plant, but dose should be tailored to one's needs. Andrographis paniculata is a traditional Ayurvedic herb that is becoming more commonly used in the West these days for boosting immunity, as an antimicrobial (antibacterial, antifungal, antiviral), and as a strong anti-inflammatory . It is credited for stopping the spread of the 1919 flu epidemic in India, and is thought to be an equally or more powerful immune-stimulant than echinacea. The incredible thing about andrographis is that it is powerfully anti-inflammatory and cooling at the same time as being immune stimulating, which is ideal in situations where infections are causing significant inflammation. Thus, it's my belief that andrographis can be a powerful ally for CFers, especially adults with high inflammatory burdens. Like baikal skullcap, it is a very cold herb, and thus may not be best for those who tend to run cold. It is also very bitter (but I've grown to like the flavor) and so may be hard to tolerate for some (you may be able to find it in capsules). There is a supplement called Kold Kare that is simply tablets of andrographis, and these are wonderful but very expensive, so tincture form may be best if there is a need to use it long term. I take 2 mL of tincture 2xday (mixed with baikal skullcap, above). It can also be taken in larger doses when you're fighting a virus or acute infection. For me, taking this baikal-andrographis combo is critical for keeping my inflammation in check and preventing evening fevers (caused by my MRSA infection). I notice when I miss a dose. If either andrographis or baikal make you feel too cold or make your stools looser, reduce the dose. Reishi (Ganoderma lucidum or G. tsugae or ling-zi) is an immunomodulating mushroom that cuts down on histamine-mediated immune responses, calming allergic or asthmatic symptoms. It does this by interacting with the lymphatic tissue in the gut, educating T cells to shift their responses from Th2 (humoral and antibody-mediated) to Th1 (cellular, more responsive to single-celled infections like bacteria) immunity . 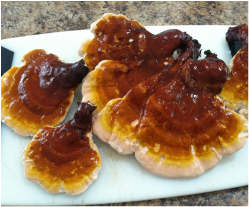 Reishi is slightly cooling nad has an affinity for the lungs, so it is ideal for situations where inflammation of the lung is causing issues (CF, asthma, etc. ), while it strengthens the body's ability to fight infection. It is also used for autoimmune diseases and allergies in general, and is effective against cancer (so are many other medicinal mushrooms including turkey tail, chaga, and maitake). Dried reishi mushroom can be decocted (simmered over many hours, usually >4 hours) and drunk throughout the day, or taken in a double-extraction tincture like this one. The dose for the double extraction is 1-2mL twice a day, with higher doses used in cancer or more severe allergies, autoimmunity, or inflammation. Lichen is a symbiotic relationship between algae and fungi. 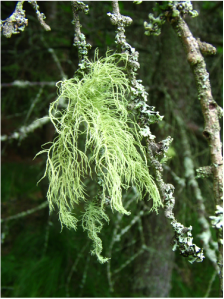 Usnea is a genus of multiple species of lichen that have both strong anti-microbial and immunomodulant properties. Usnic acid, produced by its algal overcoat, provides it antimicrobial powers , while the fungal polysaccharides that make up its stringy core stimulate the immune system to mount a stronger and more effective response. Usnea grows wild in many places around the world, including in the woods in my backyard, so I go out and harvest it myself (with respect for sustainability and regeneration of the species). It grows on branches and fallen twigs in mixed deciduous/conifer forests. It's best to harvest what has fallen to the ground. You can make a tincture out of it or just eat it raw. But cut off any brown or dead parts that you may see, wipe off any dirt, and separate it from other species of lichen that may be growing alongside it. I eat it raw and roll it into a little pill-sized ball, chew it then swallow. It's a bit bitter and spicy when fresh. It's a common home remedy around here to eat it during a cold or flu. Here's a little more info on this lovely lichen. You can also dry the lichen, separate the algal overcoat from the fungal core, powder the algae, and use it as an antiseptic powder to sprinkle on wounds. The dose for eating raw usnea is a little jelly-bean sized ball, eaten 2-3 times per day. Cinnamon (Cinnamomum verum) is used in traditional medical systems to treat diabetes, stabilize blood sugars, and warm the body. It is a warming diaphoretic herb that can help bring the body temperature up during a low-grade fever to help the immune system kill pathogens. But the main use of cinnamon these days is to control blood sugar. It has multiple mechanisms of action including inhibiting polysacchride-cleaving enzymes, increasing insulin sensitivity, and providing mucilage to slow down food's transit in the GI tract which reduced blood sugar spikes . Cinnamon acts as an alpha-glucosidase inhibitor. Cinnamon is an important tool for those of us who have blood sugar irregularities, or have CFRD. It can be used on its own or in conjunction with insulin (if you have CFRD). It is an ideal herb to use for those who have been diagnosed with glucose intolerance, but are not yet diabetic. Cinnamon can be added to carbs, or you can take it in tablets or capsules. I used to buy tablets of cinnamon extract from Vitacost, but I've found it to be more effective to just buy gelatin capsules and fill them with cinnamon powder myself. I take at least 1.5 grams of cinnamon powder (three "00"- sized capsules) with a carb-heavy meal, alongside my insulin. For hundreds of years people have taken "bitters" (tinctures of bitter herbs) before meals to help prepare the digestive system for complete assimilation of foods and to prevent GI discomfort and indigestion. The bitter taste triggers the central nervous system to release the necessary elements for proper digestion, including bile from the gallbladder, pancreatic enzymes, hydrochloric acid in the stomach, pepsin (an enzyme released in the stomach that breaks down protein), and gastrin . These herbs include dandelion, burdock, gentian, motherwort, wormwood, angelica, artichoke leaf, yellow dock, and many more. Put half to one dropperful of the tincture onto the tongue (you must taste it in order for it to work) 5-15 minutes before eating, especially before fatty foods. I believe that bitters are one of the most critically important medicines a CFer must use (in addition to pancreatic enzymes) in order to digest properly. I carry my bitters with me everywhere. When used regularly they will correct and prevent reflux/heart burn (and can also be used after meals for post-meal reflux), gas, bloating, and indigestion of all sorts. You can make a tincture of bitters yourself (dig up some dandelion roots yourself, dry them, stick them in some organic vodka, steep for a month, strain, and voila!) or buy them from a natural food store or online. You can get the same effect by eating a salad of bitter greens (like arugula or dandelion greens) before meals, or even something sour and pickled, like sauerkraut or kimchi. Elecampane (Inula helenium) is a root used specifically for clearing up respiratory infections. It is antimicrobial (with activity against Mycobacterium tuberculosis ), an expectorant, and an immune stimulant. It kills pathogens and helps to move mucus out of the bronchial passages by stimulating cilia movement (little hairs in the respiratory system that pulsate to move things upward and out) and by thinning mucus slightly. It is one of the strongest herbal stimulators of the muco-ciliary escalator, and can help regrow cilia when they are damaged. Furthermore, it is a warming digestive bitter and contains inulin, an important pre-biotic fiber that can help restore healthy gut flora. It is also an immune stimulant, increasing the number of T cells. Is this herb perfect for CF or what?! A normal dose of tincture is 1-2 mL 3-4xday, but I was advised that during acute exacerbations or infections, 1-5mL 4-5xday may be a more appropriate dose. Thyme (Thymus vulgaris) is a highly antimicrobial herb that contains strong essential oils such as thymol, carvacrol, and linalool, among others. It is especially helpful against lung infections, colds and flus, sinus infections, as well as infections of the throat, mouth, and GI tract. Its essential oils have shown to be very effective at killing viruses, fungi, gram-negative and gram-positive bacteria, including MRSA and other antibiotic-resistant bacteria . When experiencing respiratory exacerbations, or when you have a cold or flu, the dose in tea is 1 tsp of thyme leaves (fresh or dry) per cup of hot water (covered and steeped for 10-15 minutes) 3xday. It is a good idea to include a bit of rosemary in the tea as well, which acts as a bacterial efflux-pump inhibitor, making antibiotics more effect at killing bacteria . You can also take a tincture of it (best in a formula with other herbs, since it's so intense) with a dose of 2-5mL 4-5xday. Taking small doses more frequently is most appropriate during an acute illness. It may also be a helpful herb when trying to correct gut dysbiosis, as part of a larger protocol. Milk thistle (Silybum marianum) is one of the more well-known and popularly-used herbs in the West, and for good reason. It is a powerful protector of the liver and can be helpful in treating and preventing all kinds of liver issues, from mild to acute. In fact, in Europe the primary constituent of milk thistle, silymarin, is used as a pharmaceutical drug for rescuing people from acute toxic liver failure (drug name is Legalon SIL) . Milk thistle is extremely safe, even at high doses, and can be useful in helping those with chronic exposure to possibly hepatotoxic drugs and environmental exposures (i.e. CFers) prevent or reverse liver damage. Milk thistle works by stimulating the liver to produce its own endogenous glutathione, the body's primary antioxidant, which can rescue the liver from oxidative damage caused by toxins or infections. It also upregulates phase II detoxification and acts as a direct antioxidant in the liver. I take milk thistle everyday since I am constantly exposed to drugs that are hard on my liver, and I increase the dose when I am in the hospital. The best form to take it is in pill form, with a standardized extract of about 80% silymarin. The effective dose is 300-500mg 2-3xday for maintenance, or about 1 gram 2-3xday for serious liver issues (liver cancer, advanced cirrhosis, etc.). There is no known harmful or toxic dose, so it's safe to take a lot. American Ginseng, an endangered species. Adaptogens are a class of herbs that help the body become more resilient to physical and emotional stress . They do this in large part by regulating cortisol levels. Every adaptogen works a little bit differently and each has its own energetic profile, so it is important to consult an herbalist when choosing which adaptogen is right for you. I believe that adaptogens are an important part of a CF herbal protocol because of the extensive amount of stress (both physical and emotional) that we endure on a daily basis. Using adaptogens over the long term helps the adrenal glands stay healthy and prevents HPA axis dysregulation and adrenal fatigue/collapse. There are many adaptogens that have been used throughout the centuries in pretty much every part of the world to improve physical/athletic performance, mental clarity, and recovery from illness. These include: ashwagandha, American ginseng, Korean ginseng, eleutherococcus ("Siberian ginseng"), rhodiola, schisandra, licorice, shatavari, and others. Talk to an herbalist about which one may be best for you. There are many, many more herbs out there that can be helpful for CF, but these are the ones that I've personally tried and studied. If you have suggestions on ones to add to this list, let me know!